Indian music has become a global musical language but its South Asian roots remain strong, diverse and local. This anthology covers the ''golden years'' of the movement, from approximately 1970 until 1983. Much of the music on this compilation springs from the Bollywood film industry; composers such as R.D. Burman and the brothers known as Kalyanji Anandji, whose work makes up much of this anthology, recorded and released an inordinate amount of soundtracks. That experiments in the fusion of India's classical traditions of Hindustani and Carnatic music, folk music such as bhangra and dandiya and Western psychedelia and funk music would occur at some point is only natural. 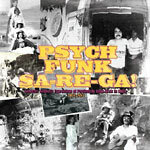 Also included are off the beaten path Indian experiments in Psych Funk - for example, two songs from the Simla Beat garage-psych albums, and an oft-heard Deep Purple cover by the ground-breaking Atomic Forest - and examples of the Indian Psych Funk influence on European 70s musicians. Includes deluxe 52-page booklet with detailed annotation plus never-before-seen photos and ephemera.